MIAMI -- Jonathan Papelbon sat at a table in the middle of the clubhouse at Dolphin Stadium shoveling in his postgame meal, prompting Coco Crisp to make the inevitable vacuum comparison. The rookie closer's face, as it often is, was placid, with no indication of the emotional pregame scene in the manager's office. Terry Francona, given the duty of alerting his bevy of All-Stars that they had made the American League team, called Papelbon into his office, a place that seemed far less comforting back in 2000, when Francona was fired as manager of the Phillies during an end-of-the-season series against the Marlins. He recalled the experience to Papelbon, in the process breaking down, his tears mixing with a genuine joy at delivering the news that he had been named to the All-Star team, getting the most votes of any reliever in the balloting from AL managers, coaches, and players. ``I started telling him the story and got all emotional all over and just embarrassed the hell out of out myself," said Francona, after Papelbon had tied Chicago's Bobby Jenks for the AL lead in saves with his 25th and lowered his ERA to 0.43 in the Red Sox' 4-3 win over the Marlins. ``I was so happy for him. Just the look on his face. To me that was a slam dunk. To see it just was really fun for me to be able to say that." 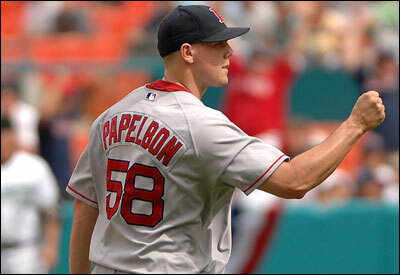 And Papelbon, as expected, wasn't the only one. With the closer, first baseman David Ortiz (.276, 26 home runs, 75 RBIs), outfielder Manny Ramírez (.309, 22 HRs, 60 RBIs), and -- in a bit of a surprise -- second baseman Mark Loretta (.317) rounded out the crew bound for Pittsburgh next week, joining a group that includes fan balloting winners Ivan Rodriguez of the Tigers, Alex Rodriguez and Derek Jeter of the Yankees, Vladimir Guerrero of the Angels, and Ichiro Suzuki of the Mariners. The National League starters include St. Louis' Albert Pujols (the leading vote-getter with 3.4 million), Philadelphia's Chase Utlay, Pittsburgh's Jason Bay, Washington's Alfonso Soriano, and a quartet of Mets: David Wright, Jose Reyes, Carlos Beltran, and Paul Lo Duca. It wasn't all satisfying news in the Red Sox clubhouse. Starters Curt Schilling and Josh Beckett and catcher Jason Varitek will be home for the All-Star break. ``Given what's happened over the last 18, 24 months, to be in this position is very rewarding," Schilling said. ``Obviously going is a big deal. It means something and it always has. . . . Having your kids involved, at this age, it's a big deal to [11-year-old son Gehrig], so it's a big deal to me." Schilling, who seemed to be a lock, is 10-2 with a 3.54 ERA and 102 strikeouts. Schilling may be a victim of the requirement that each team gets at least one representative. Of the three starters named by manager Ozzie Guillen, two -- Kansas City's Mark Redman and Oakland's Barry Zito -- are the only representatives of their teams. Guillen gave the other slot to Mark Buehrle, one of his own starters, who was roughed up for 11 runs (10 earned) and 13 hits in a loss to the Cubs yesterday, his ERA rising from 3.22 to 3.86. Buehrle is one of six White Sox on the roster, tying the Mets for the most players selected. ``I still am holding out hope that I think Schill maybe has a chance if something happens," Francona said. ``I don't think there should be an All-Star game this year without Schill. I think that's kind of a shame." The manager is hoping Ramírez, on the other hand, won't play. So, it seems, is fellow All-Star Ortiz. ``I said to him, `You've got to chill out,' " Ortiz said. ``The All-Star Game and everything is good, but you've got a second half coming in. We need Manny." With Ramírez being taken out of a number of games in the later innings to protect a sore right knee, Francona doesn't want additional stress placed on his slugger, who nabbed the most votes of anyone in the AL fan balloting. Francona would rather keep him out of the game -- which Ramírez has begged off twice in the past -- and keep him around for the remainder of the season. He doesn't want the glorified exhibition to cost him real games. ``If somebody's going to take some heat, I hope it's me," Francona said. ``I already asked him to not play. I didn't tell him he couldn't play. I've asked him in the interests of our ball club, I think it's something he needs to think about. I'm hoping that's what he'll do." With Ortiz and Ramírez making the team, questions surrounded Varitek, who was leading the last time the fan votes were released, and Loretta, who was trailing injured Yankee Robinson Cano. But with Rodriguez winning out and the Twins' Joe Mauer (major league-leading .392 average) taking the player vote at catcher, there was no room for Varitek. Loretta, though, cleaned up in the final week, a fact he credited to Red Sox fans. Loretta, who will be making his second All-Star appearance, said this will be different. When he showed up in Houston for the 2004 game, as the sole member of the Padres named to the roster, he wasn't exactly sure of the procedure. Sure, he was a 10-year veteran. But that was his first All-Star Game, and he was alone. ``There's no question there's a sense of awe when you walk in that locker room with the best players in the world," said Loretta, who managed to snag a Roger Clemens autograph last time and plans to target Tom Glavine this year. ``That stage of your career, you fit in any locker room, but I didn't know really what to do. Didn't know whether to ask guys for autographs. I think I'll be able to savor it a little more this time."